he country is split into five viticultural zones. Running from north to south, they are: Atacama, Coquimbo, Aconcagua, Valle Central and the Región del Sur. These zones contain a number of sub-regions and these may also be further subdivided. Atacama and Coquimbo are well to the north of the country. These are hot and dry, requiring mass flood irrigation, and generally produce basic table grapes as well as Pisco, the local brandy. There are new vineyard plantings at Coquimbo nearer the coast, where the climate is moderated by sea breezes. Some good rich and full-bodied reds are also now being produced both from the Bordeaux varieties and from Syrah further inland at altitude in Limari. You have to travel further south, though, to find vineyards capable of providing good quality wines in any volume. The region of Aconcagua includes the important sub-regions of Casablanca and San Antonio, where the vineyards are cool and nearer the coast. These is now a well-established source for some of the better white wines in the country with fine Syrah and Pinot Noir also emerging from San Antonio. Chardonnay, Gewürztraminer and Sauvignon Blanc are all successful. The Valle del Aconcagua itself is warmer and and becomes increasingly hot further inland. Eastern Aconcagua is largely red-wine territory. Some of the best sites are on well-drained slopes and the super-premium Seña blend is sourced from the area. The Valle Central is a substantial zone, which includes Chile’s capital city Santiago to the north. The suburbs encroach into the vineyards of Maipo, the northernmost of the zone’s sub-regions. The valley runs 400 km north to south, taking in Rapel, Maule and Curicó. 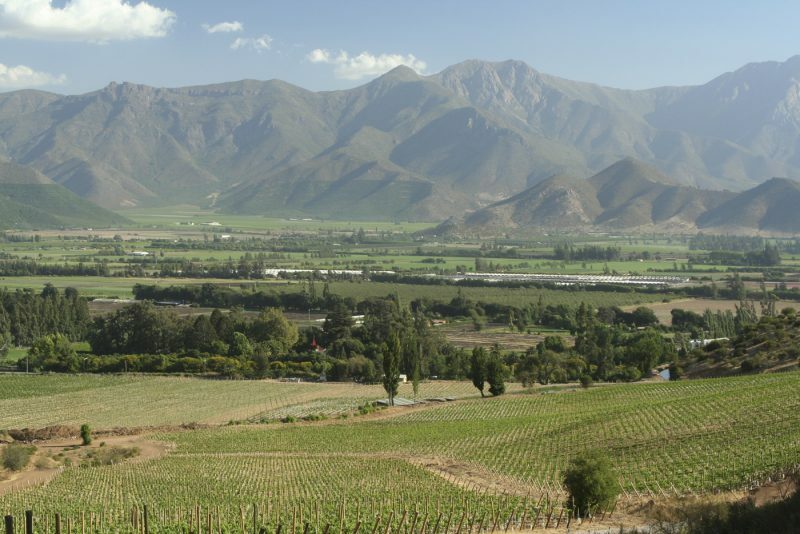 The two key elements which influence grape growing here are the coastal fogs, which drift a long way inland and moderate the climate, and the Andes Mountains. The latter provide an important water source for irrigation. One of the problems encountered over the past decade has been over vigorous and over productive vineyards. Increased use of sophisticated drip irrigation systems is helping to overcome such vineyard problems. More wines are offering ripe and vibrant fruit now as opposed to some of the overtly green flavours that were so widespread just a few years ago. The best reds from Maipo have traditionally been Cabernet-based but increased plantings of Rhône varieties is a continuing trend. Rapel is very promising for fine wine production with Cabernet Sauvignon, Merlot and particularly Carmenère successful in the warmer south of the region at Colchagua, while earlier-ripening varieties including Chardonnay, Sauvignon Blanc and Pinot Noir are more successful in cooler Cachapoal. There are both promising reds and whites to be found at Curicó. Growing conditions are aided by large mid-season temperature fluctuations which help in preserving the acidity in the grapes. Maule to the south is largely dominated by white varieties but there is some good Merlot too. The coastal vineyards of Leyda offers fine whites as well as good Pinot Noir. To the south is the Región del Sur including the two sub-regions of Itata and, immediately to the south, Bío Bío. Unsurprisingly, this being the most southerly of the grape-growing regions, the climate is cool and rainfall is also high. Sophisticated trellising and the planting of early-ripening Pinot Noir and Chardonnay as well as Alsace varieties has shown some potential. The best results so far have come from Bío Bío.